To provide a comprehensive overview of emerging concerns in the field of educator, inspiring and thought-provoking views of great thinkers of the East and the West are given in an easy-to-understand language, with a critical and meaningful analysis where needed. The role of the family, neighborhood, community and the school in the optimum development and growth of the personality of the child is suitably highlighted. Agencies of Education: School as an Agency of Education. J.C. Aggarwal is a former Dy. Director of Education and Executive Director of the Delhi Bureau of Textbooks, Delhi Administration, and Delhi. He worked at the grassroots level as a Post-graduate teacher, principal, plan evaluation officer and educational supervisor and administrator. Me also taught in a PQ Teacher Training College. 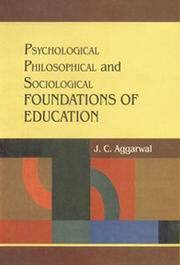 He has widely travelled and written extensively on education.